Welcome to LUANG PRABANG! 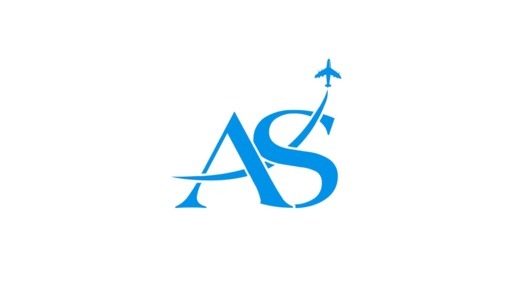 Upon arrival in Luang Prabang airport, you will be welcome by our Asia Senses guide at the airport then escorts you to your hotel in city. Check in hotel. 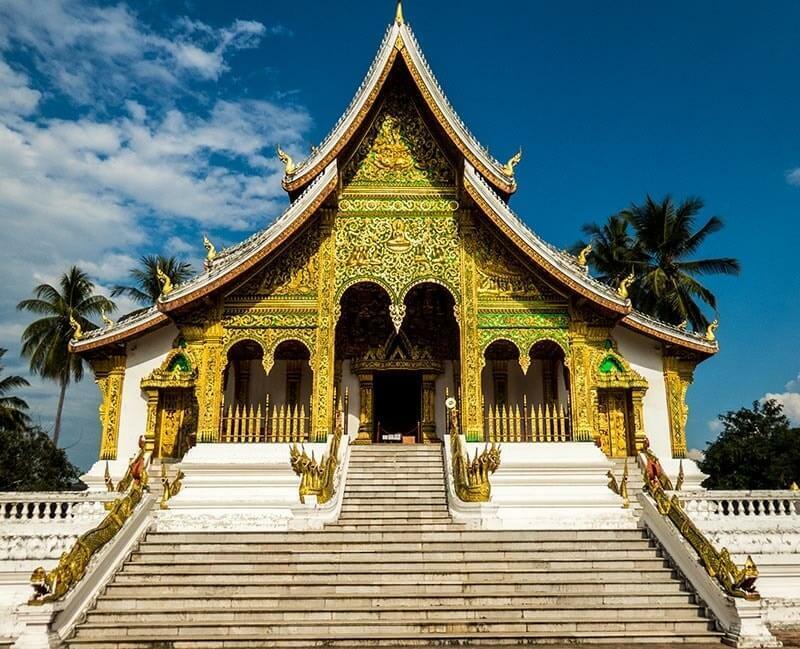 After that, pay a visit to Wat Xieng Thong, dating back to the 16th century, it is considered the most beautiful temple in Luang Prabang. Then visit the Mount Phousi to sightsee the view of Luang Prabang and its countryside. Our next destination is Wat Aham which means “Monastery of the Opened Heart” and the stupa of Wat Visoun. In the evening, you could stroll through Luang Prabang’s bustling night market, which is open daily from dusk until about 10pm. Tasting local street food, drinking the famous Laos Beer and buying souvenirs for your family and friends. Today's unique experience is a “Monks life encounter’. Buddhism is the basis of Laos culture and temples play an important role in Laotian daily life. 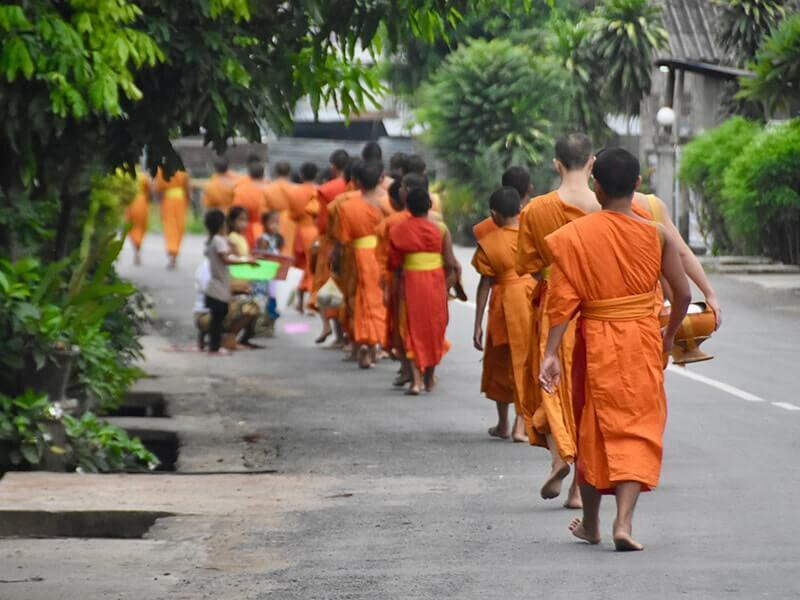 The daily alms-giving ritual is a must-see for any visitor to Luang Prabang, a “Monks life encounter' offers the opportunity to participate in this practice in an authentic manner at a local temple. Start our sightseeing day with the visit to National Museum, once a king's palace. Displayed inside is a lovely collection of personal artifacts of the royal family, including photos, musical instruments, and many gifts received from the dignitaries of foreign countries. Then head to a pier on Mekong River. Begin a Mekong riverboat trip on the mighty Mekong River to visit the famous & sacred Pak Ou Buddha Caves. These caves, overlooking the confluence of the Mekong & Ou Rivers from on high, have been home to many thousands of Buddha images that were placed here by local people since 16th century. Ride back Luang Prabang for lunch. In afternoon, continue to visit Kuang Si Waterfalls, where you will enjoy beautiful natural scenery, have fun in waterfalls and relax. Drive back to the town for dinner. On the way back, we will stop to visit a Black Hmong village. You will see and chat with villagers who make handicraft as souvenirs and sell them for visitors. 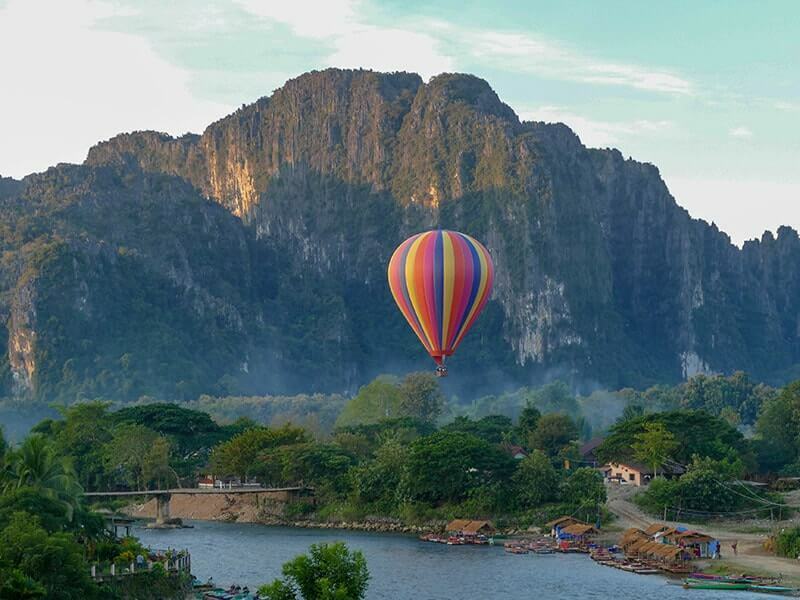 Today, drive to VANG VIENG, a riverside town, on the Nam Song River in Central Laos. On the way, drive through splendid scenery and past many panoramic lookout points on the winding mountaintop road. There are several stops en route to take in the scenery. Enjoy lunch at Vang Vieng restaurant. In the afternoon, visit Tham Jang Cave and Tham Chang Cave with their stunning view over the valley. Taking nice photos at Nam Song River. After breakfast, drive ahead to Vientiane, leave the karstic mountains for the rich plain of the Mekong. Along the way, you have chance to explore the local cultures by greeting the local villagers and observing their daily lifestyle. On the way, stop at Nam Ngum Lake and embark on a boat for a one hour tour on the lake among small islands. Your lunch will be served on boat. After the lunch, drive to Keun, a salt extraction village. Watching local people who are making salt with traditional method. 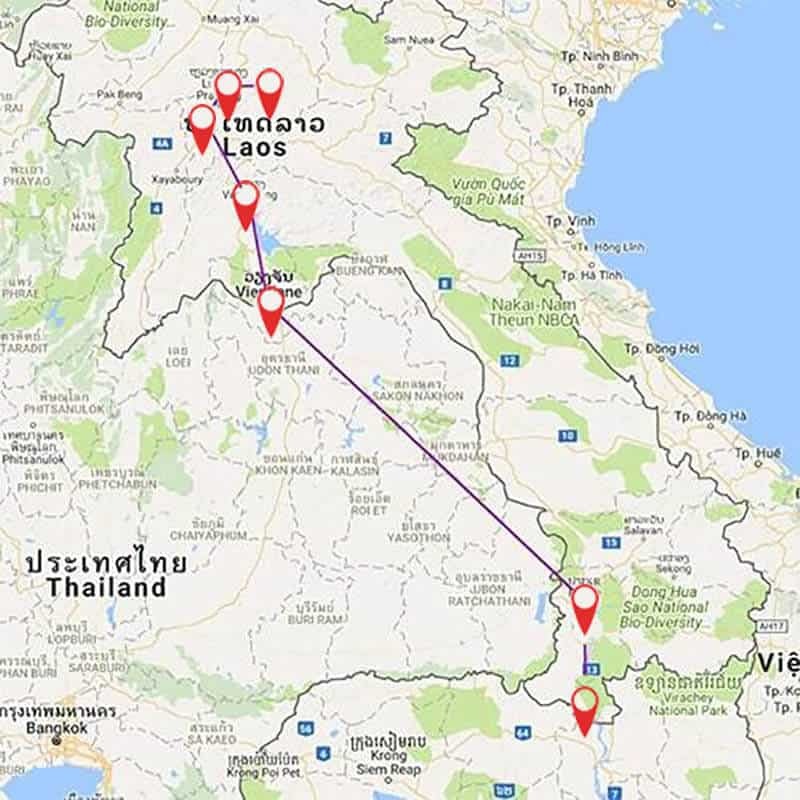 Then continue on our way to VIENTIANE - the capital of Laos. On arrival hotel, free at leisure at hotel. Having dinner and relaxing. This day, visit Vientiane, the charming capital city of Laos with rich heritage of Buddhist culture, is waiting for you to discover. Your guide will take you to visit the highlights of Vientiane. Firstly, you will get to learn about history of Laos by visiting the Laos National Museum, the best place to learn about the history, cultural and people of Laos. Continue to visit the temple Wat Sisaket which is the oldest surviving temple with thousands of Buddhist images. After that, you will Wat Simuang and Wat Prakeo which housing the famous Emerald Buddha image really amazed the Indochina tour makers. 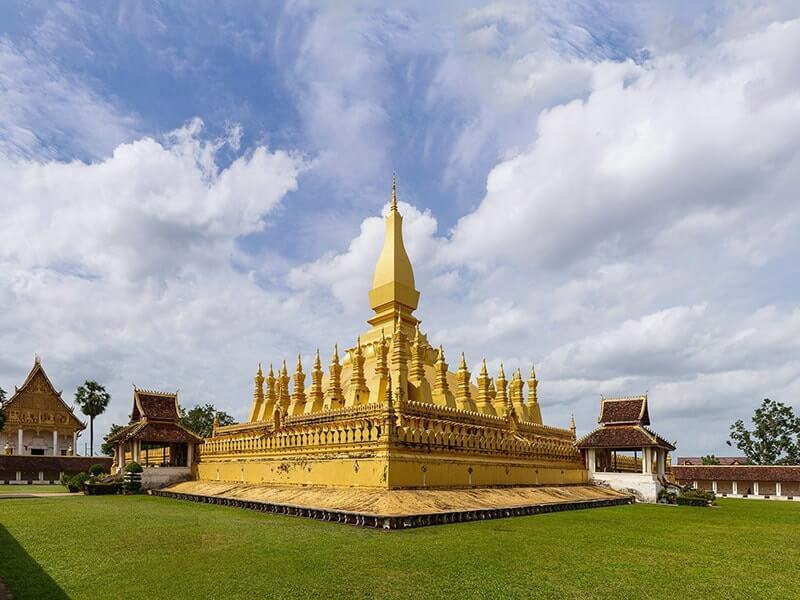 There is a chance to visit the symbolic site Pha That Luang Stupa - the most important national monument in Laos. It is a symbol of Buddhist religion and Lao sovereignty. Then, take a visit to Patuxai Monument (Victory Monument). You could climb up to the top of this monument then see panoramic Vientiane. Enjoy the rest of the day at your leisure to relax. You can also have a relaxing walk around the hotel to discover the city or stroll along the river bank to enjoy sunset. Overnight at hotel in Vientiane. 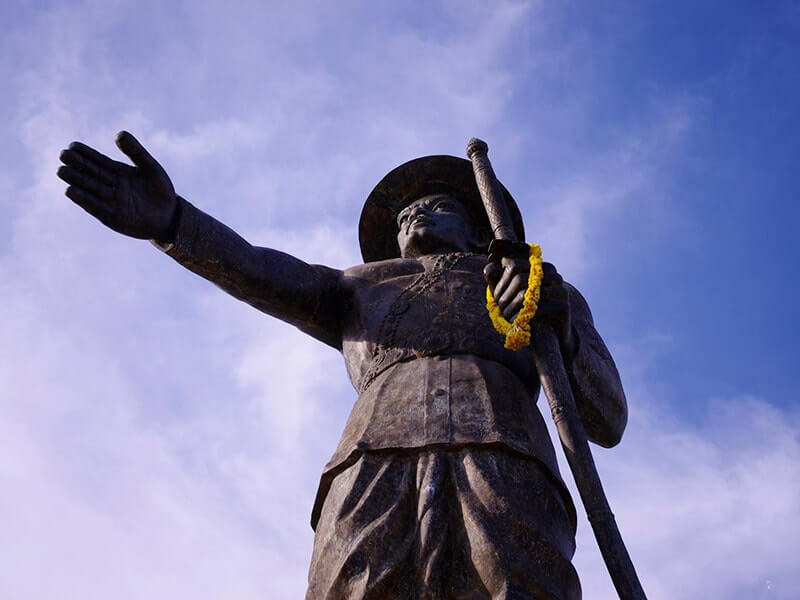 Today fly to PAKSE, the laid back provincial capital of Champasak. On arrival in Pakse, our local guide will pick up then transfer you to hotel for check in. After a short break, take a short transfer (36km) to Bolaven Plateau. The plateau is located in an ancient volcano which erupted millennia ago and is full of lush vegetation, rich soil and a year-round temperate climate that is the perfect environment for growing Arabica and Robusta coffee. Along the way, you could see lush, beautiful coffee farms. 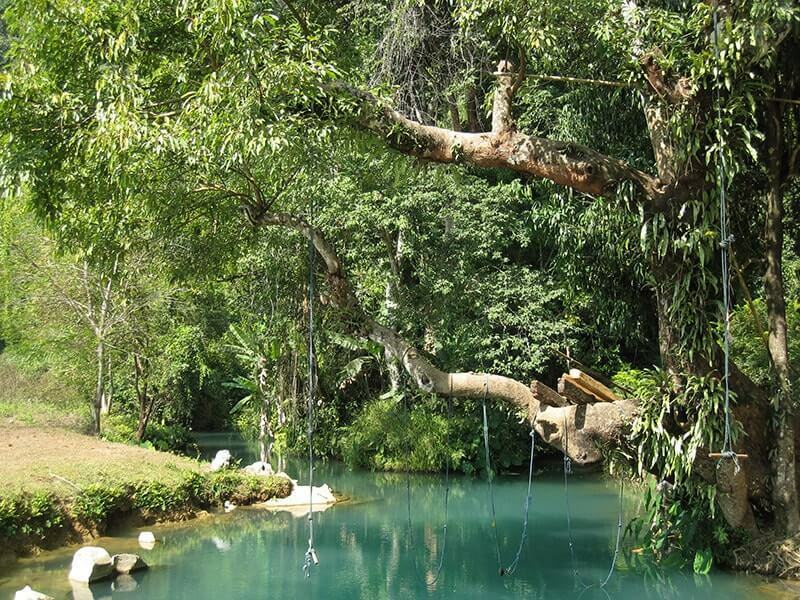 Visit E-Tu Waterfall is located between Pakse and Paksong, offers a serene place for refreshing swimming. Then stop at Fane Waterfall which is 3 km far from Ban E Tu waterfall. 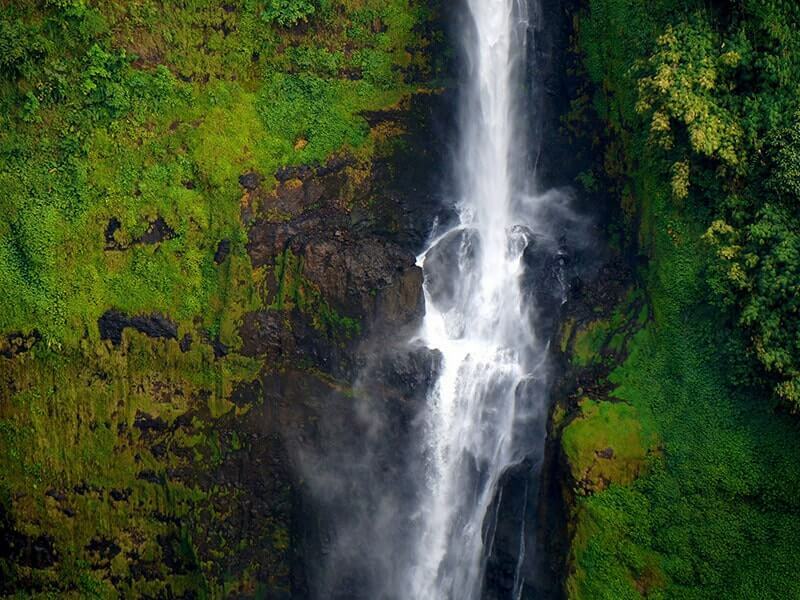 It is the tallest waterfalls in Bolaven Plateau and probably in Laos. Nearby, make a stop to visit villages of ethnic minorities. After that, drive back to Pakse for dinner. Relaxing at the hotel and enjoying coffee - specialty of Bolaven Plateau. 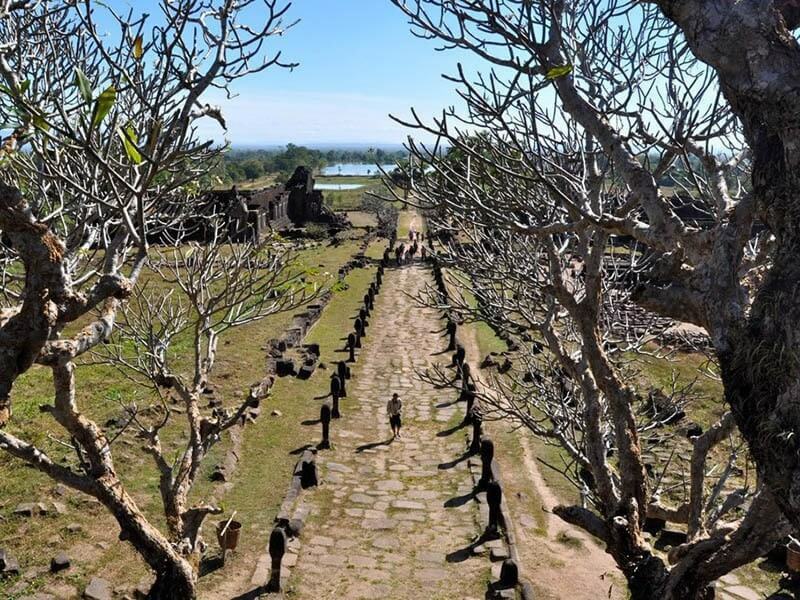 After breakfast, head south to CHAMPASAK to visit Wat Phou - one of the oldest archaeological site in Laos. It was built about 200 years before Angkor Wat. Wat Phou is located at the base of the Phu Kao mountain. The temple has a unique structure, in which the elements lead to a shrine where a lingam dedicated to Lord Shiva was bathed in water from a mountain spring. The site later became a centre of Theravada Buddhist worship, which it remains today. Wat Phou has been designated as the World Heritage Site by UNESCO in 2001. After the visit to Wat Phou, continue head south to 4000 ISLANDS (Si Phan Don Area). Enjoy the beautiful lush scenery as you take a small boat across the Mekong to Khong Island. Check in hotel and enjoy the rest of the day at leisure exploring this sedate and picturesque island and its villages on foot or by bike. In the late afternoon, observing the spectacular view of over the Mekong River at sunset from the riverside hotel is a perfect way to finish the day. 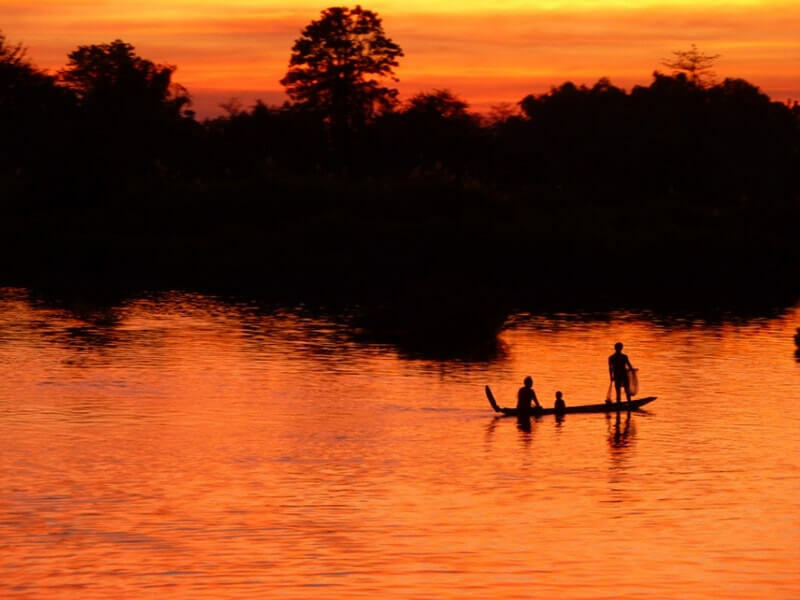 This day, take a scenic cruise on the Mekong River to visit the surrounding islands. Cruise past the tiny islands dotted throughout this tropical paradise to Khone Phapheng and Li Phi Waterfalls. If you’re lucky, you might see some of the rare and elusive pink Irrawaddy dolphins. Surprisingly, the dolphins are thought to be related to the killer whale with their large rounded heads and short snouts! Visit some of the villages on islands then experience typical Lao way of life - serene village, smiling locals and kids, rice paddy fields, coconut and bamboo trees, river and fishing nets, all are an unforgettable and lovely scene of the islands. At the Khone Island, you can see many old French colonial houses and hike along the historic railway which is built to connect the Khone Island and Det Island. At the end of tour, return to Don Khong island. Today, we make a farewell to the beautiful Si Phan Don and take a ferry across the Mekong River from Tha Ban Na to Tha Ban Hat. Then drive north back to Pakse city for your onward flight. End the Highlight of Laos Tour.